If you haven’t used sourcemaps, now is the time! With the advent of compiled CSS like LESS or SASS, or minified/uglified JS, it makes debugging awkward as you cant see the original lines of code that you wrote. Cue CTRL_F’ing to find that line to tweak! But not any more! When you generate your LESS/SASS, if you tell it to compile a sourcemap too, it will create one! This allows your browser to report which line of the less or scss file the rule in question came from. --source-map-basepath=X  Sets sourcemap base path, defaults to current working directory. 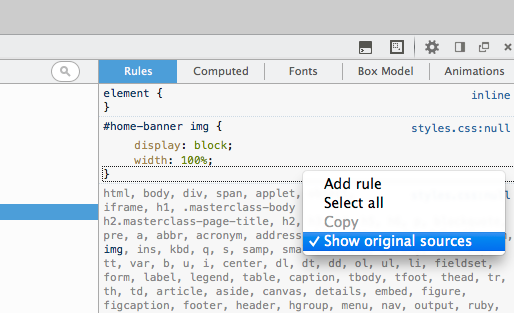 In the CSS rules pane, right click, and make sure show original sources is checked. To the right of the actual rule, you click the link which would usually take you to the CSS file for viewing, but now, it takes you to your Less/Sass file! You can now tweak rules and save them directly from the inspector! In my new workplace, our SASS files are compiled by Gulp automatically. (In my last work I had lessc configured in PHPStorm). If your own files are automatically built, then you should also checkout Firefox addons for live reloading! The great thing about that is that the CSS files update without refreshing! Great if you have session info or other info that might need reinstantiating, you dont have to keep keying stuff in! Have fun! Go to File > Settings, and under the project settings look for File Watchers. Click the green + to add a watcher. Select LESS. And on linux machines, you can find it elsewhere. I cant remember offhand, but just take note of the output while you are installing it and you wont go far wrong. It is absolutely incredible. I’m ditching all my current CSS files and refactoring them to use this stuff! There’s no turning back from this yeehah! Website looking great? Did you check it on your phone? Or your iPad? My shiny new website uses an awesome jquery tool called Coda Slider. It’s really good, but I kind of left the old fashioned people with a 1024×768 resolution behind, as my sites default width (and my slider image widths) are 1200px! Now we have an awesome slider! That shrinks the image width and panel containers to fit 🙂 A bit hacky, but I still like it. Next time though, I’ll do my CSS in em’s and %ages!